Roasted Potato Salad with Bacon Vinaigrette is delicious twist on traditional potato salad. 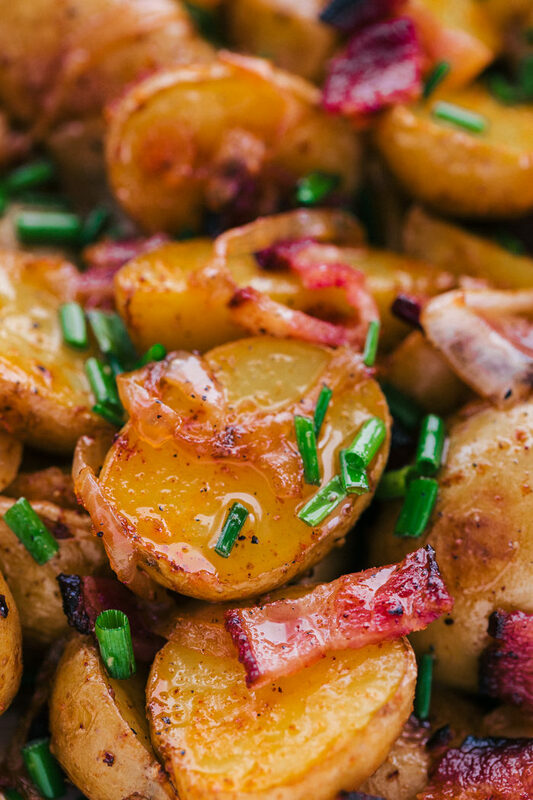 The potatoes are roasted to a crisp and tender perfection and topped with a creamy bacon vinaigrette dressing. 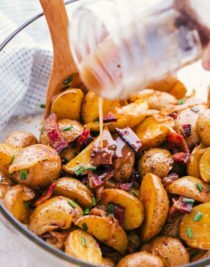 Roasted Potato Salad with Bacon Vinaigrette is such a delicious salad option for all your summer fun. The potatoes are roasted to light crispiness on the outside and are warm and tender on the inside. Roasting them just gives the potatoes a little more flavor and texture with every bite. This salad is dressed with a creamy bacon vinaigrette dressing that brings so much flavor to the potatoes you don’t need to overload it with other ingredients. The bacon and sautéed onions are all you need to complete this sensational side. What is Roasted Potato Salad? Different than traditional potato salad in that you don’t boil the potatoes, you roast them in the oven. Roasting the potatoes gives them a crispy outside and a warm tender inside. The salad is served with dressing which has a balsamic base to it rather than a mayonnaise dressing. Roasted potato salad is also served warm, rather than cold like traditional potato salad. 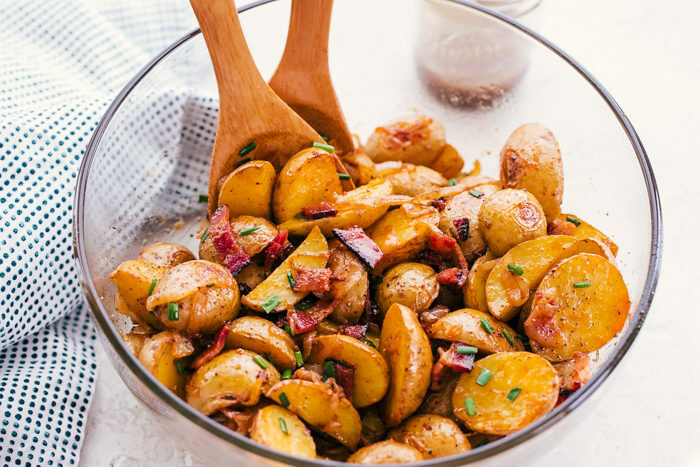 For this Roasted Potato Salad with Bacon Vinaigrette I used baby gold potatoes, but you can absolutely use red, Russet, white, or purple potatoes or a combination. The golden potatoes have a butter flavor to them so it just adds to the creaminess of the salad. How do you roast potatoes? Cut the potatoes in half or quarters depending on how large they are and how large you want your pieces. Place potatoes in a large bowl and toss with olive oil, garlic salt, onion powder, paprika and pepper. Toss to coat. Add olive oil to a rimmed baking sheet and pour potatoes on top making sure they are turned out with the skin side down. Roast for 35-40 minutes until crispy and golden brown. Roasting potatoes is very easy and they come out so crispy and tender that they almost melt in your mouth. How do you make roasted potato salad? Cut the potatoes in half. Place potatoes in a large bowl and toss with olive oil, garlic salt, onion powder, paprika and pepper. Toss to coat. Roast for 35-40 minutes until crispy and golden brown and set aside. While potatoes are roasting sauté the onions in a skillet. Add onions, brown sugar, and white vinegar. Sauté for 5 minutes until soft and translucent. Remove onions and cook bacon until crisp reserving bacon drippings for dressing. Once potatoes are done let cool slightly and place in a large bowl. Toss with onion mixture, season with salt and pepper and drizzle with dressing. Stir in chopped bacon and chives, serve warm. How do you make Bacon Balsamic Vinaigrette? Blend on high until smooth. Pour into a sealable glass jar or container and store in refrigerator until ready to use. Shake vigorously before pouring over salad. 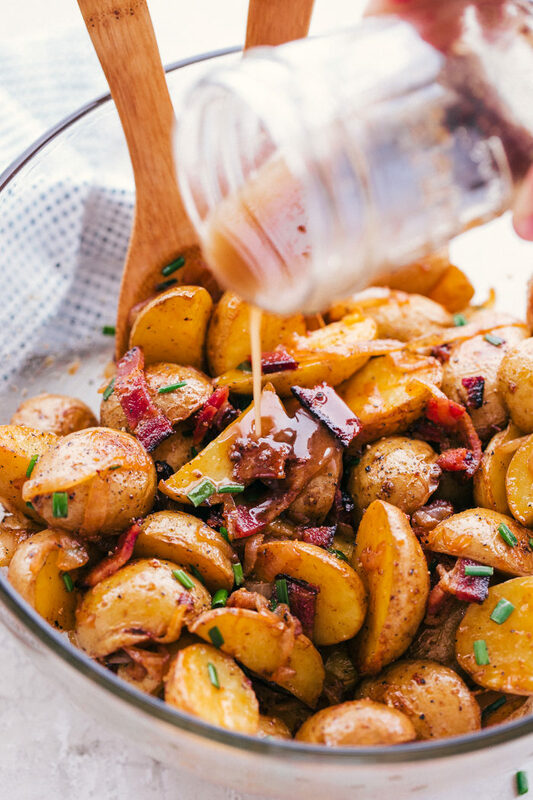 This Roasted Potato Salad with Bacon Vinaigrette is simply delicious and the perfect side for all the summer fun and BBQ’s. Salads don’t have to be just lettuce and vegetables, but they do need to be delicious. While potatoes are roasting sauté the onions in a skillet. Add onions, brown sugar, and white vinegar. Sauté for 5 minutes until soft and translucent. Remove onions and in same skillet cook bacon until crisp reserving bacon drippings for dressing. Prepare the dressing: In a blender or food processor add all the ingredients and pulse until smooth. Store in an airtight container in the refrigerator until ready to serve.